What are the initial instinctive and impulsive thoughts whenever somebody asks for your reaction on the functioning of Non Governmental Organizations (NGOs)? While I have been seeing the functioning of NGOs at the field level almost from 1990, the article in "Crest edition of Times of India" in its issue dated September 18th, 2010 titled "Nil at Ground Zero" brings out the stark reality regarding the murky & shady manner in which more than 90% of the NGOs operate and the absence of any semblence of transparency and accountability in their functioning. Most of them, with exceptions ofcouse which are far and few, adapt their expertise to suit the funding availability and operate on a fly by night attitude. The article mentions that out of some 3000 NGOs that are prevalent in each of the KBK districts of Orissa, hardly 100-200 are actually functional while the living conditions of the tribals continue to get worse. KBK or Orissa is no exception and similar is the case with streams of NGOs which sprung up overnight, all claiming expertise in "awareness creation" regarding HIV/AIDS campaign when they smelt huge funding available under HIV/AIDS programme of NACO. Impact assessment have shown that these awareness campaigns have made little or no difference. What is it which make these NGOs so bold and adventurous and almost criminally impatient in their eagerness to make fast buck? Why there is no accountability? No transparency in their functioning and accounts maintenance? Why no punitive action except for occassional 'black listing' of few NGOs who are more of scapegoats while the big fish get away to the bigger crimes. There are expert consultants who help these NGOs prepare report using the appropriate jargons and terminology which suits the funders and these consultants also leverage on their 'connections' in such organizations including Government Departments guaranteeing the sanctioning of funds. And nothing comes free. There have been serious concerns with fast eroding credibility of NGOs yet little is done to regulate their functioning. The need to have a 'Regulatory Authority' is being talked about but not much is done in this direction so far. As a result, not only the targeted segment for whom these NGOs are supposed to work continue to suffer where they were or get even worse but also the Donors start shying away over a period of time leading to crowding out of funds. The functioning of these Charity Organizations is under the purview of the Charity Commission. 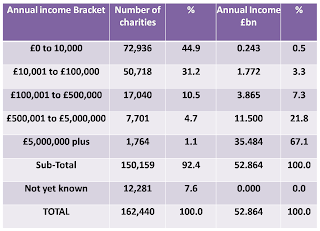 All Charity organisations located in England and Wales, whose income is more than £5000 per annum need to be registered with the Charity Commission . The Charity Commission for England and Wales (Welsh: ComisiwnElusennauCymru a Lloegr) is the non-ministerial government department that regulates registered charities in England and Wales. The Charity Commission answers directly to the UK Parliament and to Government ministers. It is governed by a board, which is assisted by the Chief Executive (currently Andrew Hind) and an executive team. Prior to 2008, the law assumed that advancement of education or religion were automatically in the public interest. A "public benefit" now needs to be demonstrated. The Act raises the threshold above which registration is required with the Charity Commission from £1,000 to £5,000.Charitable organisations based in England and Wales have to register with us if their income is over £5,000 a year. Charities are accountable to the public, so charities registered have to provide certain information about the way in which they operate and how they use their resources. The information is available online so everyone can see how each charity’s money is used. To view the information on an individual charity, one can type its name or charity number into the 'Search for a charity' box at the top of every page on this website. One can also use the Register of Charities Advanced Search to find information on particular types of charity. The Charity Commission is the independent regulator for charitable activity and the mission of the Commission is to ensure legal compliance, enhancing accountability, encouraging effectiveness and impact, promoting the public interest in charity and to promote the public's trust and confidence. The aim is to provide the best possible regulation of charities to increase their effectiveness and levels of public confidence in them. The Commission follows the principles of best regulatory practice, ensuring its actions are proportionate, accountable, consistent, transparent and targeted. The overall approach to regulation is set out in The Charity Commission and Regulation. There’s complete information on Charities whose filing of annual accounts are due. Likewise, the site has an exhaustive detail s of all the charities that have been removed and the grounds therein. For instance, there are 68 charities whose income were £10,000,001 and above and have been removed. (this includes London Business School (LBS) which was removed in 1997 on the grounds of ‘exempt charity’ , University of North London, St. Mary’s College among others). The Charity Commission does tremendous work in ensuring a framework of functioning of NGOs which are followed scrupulously by all the NGOs. It's not as if all NGOs in England are saints. But what's crucial is that Charity Commission has been able to pick out the bad ones from the good ones bringing in lot of credibility in the process. And this is what's required in India. We need to have a mechanism similar to Charity Commission and which has been with the statutory powers as required to ensure systemic improvements in the functioning of NGOs in India. By the way, I finally could buy two plants - a Solanum and a Spathiphy llum today from Homebase in Kensington for my window. The Solanum has multi colour fruits ( mainly orange, red, yellow and green) between October & December and its always a pleasant sight seeing plants as one gets up in the mornings.